For days seven and eight, I mixed it up with some dresses. Thanks to "Springing Forward" it's not as light in the mornings right now, which has made getting photos a little more difficult (or at least blurrier), but I boldly strive on in the name of Lent. Yesterday I wore a dress that arrived in the mail on Monday. I had pre-ordered it a while back, and while initially hesitant to purchase a red dress, I'm glad I did. It's a bit hard to tell in the photo, but there are scalloped tiers going down the length of the dress - which makes for a fun dress. 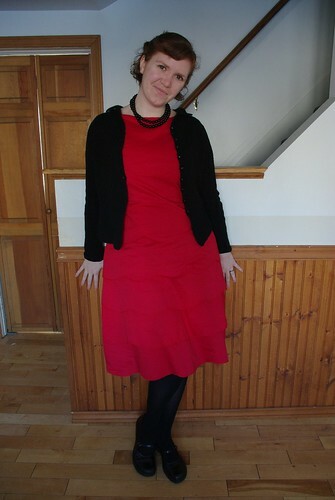 The black and red might be a little harsh, but I think I'll have fun trying different ways of styling this dress, particularly as it warms up some. 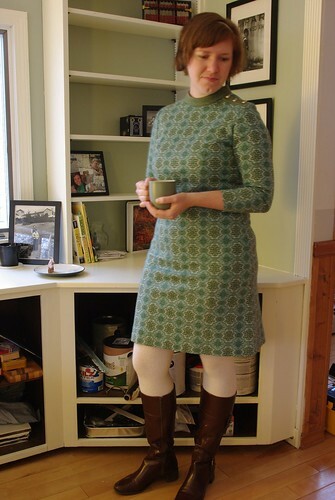 This morning I was feeling a little crummy when I woke up, so I went with the dress equivalent of comfort food. 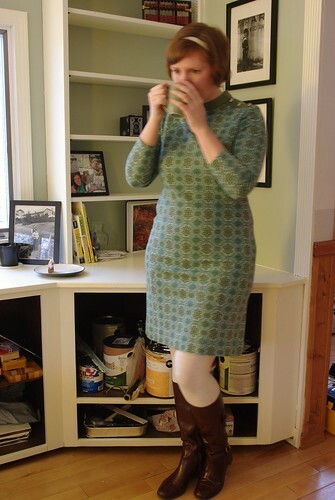 I bought this wool-poly knit dress a few years ago and it's easy to throw on and go. Also comfort food? Tea and toast with marmalade.